Displays attribute characteristics and possible values of attributes for devices in the system. The lsattr command displays information about the attributes of a given device or kind of device. If you do not specify the device logical name (-l Name), you must use a combination of one or all of the -c Class, -s Subclass, and -t Type flags to uniquely identify the predefined device. -E Displays effective values (valid only for customized devices specified with the -l flag). -F Format Specifies the user-defined format. -R Displays the range of legal values. When displaying the effective values of the attributes for a customized device, the information is obtained from the Configuration database, not the device. Generally the database values reflect how the device is configured, unless it is reconfigured with the chdev command using the -P or -T flag. If this has occurred, the information displayed by the lsattr command might not correctly indicate the current device configuration until after the next system boot. If you use the -D or -E flag, the output defaults to the values for the attribute's name, value, description, and user-settable strings, unless also used with the -O flag. The -O flag displays the names of all attributes specified, separated by colons. On the next line, the -O flag displays all the corresponding attribute values, separated by colons. The -H flag can be used with either the -D, -E, or -F flag to display headers above the column names. You can define the format of the output with a user-specified format where the Format parameter is a quoted list of column names separated by nonalphanumeric characters or white space using the -F Format flag. You can supply the flags either on the command line or from the specified File parameter. -a Attribute Displays information for the specified attributes of a specific device or kind of device. You can use one -a flag for each attribute name or multiple attribute names. If you use one -a flag for multiple attribute names, the list of attribute names must be enclosed in quotes with spaces between the names. Using the -R flag, you must specify only one -a flag with only one attribute name. If you do not specify either the -a or -R flag, the lsattr command displays all information for all attributes of the specified device. -c Class Specifies a device class name. This flag can be used to restrict the output to that for devices of a specified class. This flag cannot be used with the -E or -l flag. -D Displays the attribute names, default values, descriptions, and user-settable flag values for a specific device when not used with the -O flag. The -D flag displays only the attribute name and default value in colon format when used with the -O flag. This flag can be used with any combination of the -c, -s, and -t flags that uniquely identifies a device from the Predefined Devices object class or with the -l flag. This flag cannot be used with the -E, -F, or -R flag. -E Displays the attribute names, current values, descriptions, and user-settable flag values for a specific device when not used with the -O flag. The -E flag displays only the attribute name and current value in colon format when used with the -O flag. This flag cannot be used with the -c, -D, -F, -R, -s, or -t flag. -f File Reads the needed flags from the File parameter. -F Format Displays the output in a user-specified format, where the Format parameter is a quoted list of column names separated by nonalphanumeric characters or white space. Using white space as the separator, the lsattr command displays the output in aligned columns. Only column names from the Predefined Attributes and Customized Attributes object classes can be specified. In addition to the column names, there are two special purpose names that can be used. 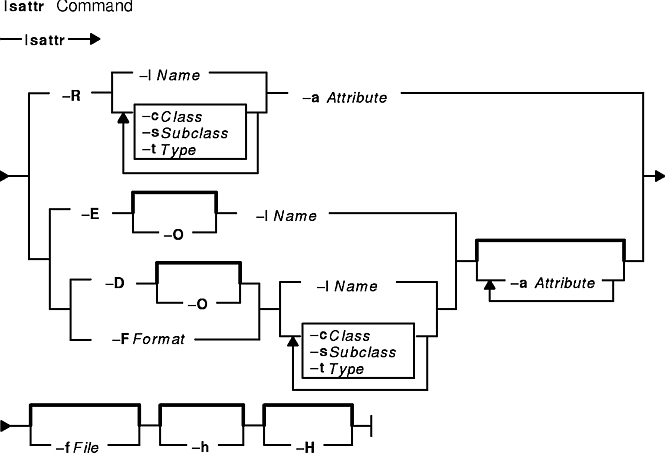 The name description can be used to obtain a display of attribute descriptions and user-settable can be used to obtain an indication as to whether or not an attribute can be changed. This flag cannot be used with the -E, -D, -O or -R flag. -H Displays headers above the column output. To use the -H flag with the -O flag is meaningless, the -O flag prevails. To use the -H flag with the -R flag is meaningless, the -R flag prevails. -h Displays the command usage message. -l Name Specifies the device logical name in the Customized Devices object class whose attribute names or values are to be displayed. -O Displays all attribute names separated by colons and, on the second line, displays all the corresponding attribute values separated by colons. The attribute values are current values when the -E flag is also specified and default values when the -D flag is specified. This flag cannot be used with the -F and -R flags. The -R flag displays the range attribute values as x...n(+i) where x is the start of the range, n is the end of the range, and i is the increment. -s Subclass Specifies a device subclass name. This flag can be used to restrict the output to that for devices of a specified subclass. This flag cannot be used with the -E or -l flag. -t Type Specifies a device type name. This flag can be used to restrict the output to that for devices of a specified class. This flag cannot be used with the -E or -l flag. Note: The same information is available in a more readable format using SMIT (System Environments -> Change / Show Characteristics of Operating Systems). /usr/sbin/lsattr Contains the lsattr command. The chdev command, lsconn command, lsdev command, lsparent command, mkdev command, rmdev command. Devices Overview for System Management in AIX Version 4.3 System Management Guide: Operating System and Devices provides information about adding, changing, moving, and removing devices.